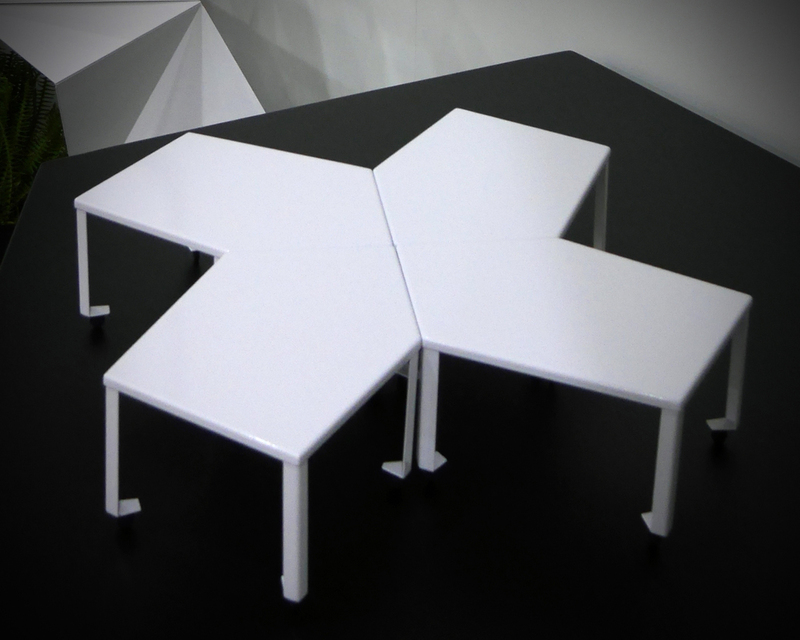 MOD is pleased to announce the release of our newest piece, the 3-4-5 Table! Named for its 3 components, 4-sided bases and 5-sided tops, the 3-4-5 Table is a modular cocktail table composed of 3 geometric solids of different sizes. The irregular, geometric solids fit together like puzzle pieces to form a large, 6-sided table, or they can be distributed around a room in different configurations. Soft Stones is featured in Min | Day's FLOCK installation on view now at the Little Gallery in Omaha, Nebraska. The show closes this weekend so make it a part of your Turkey Day plans and check it out! Soft Stones will be included in the upcoming FLOCK installation at Little Gallery in Omaha, Nebraska. 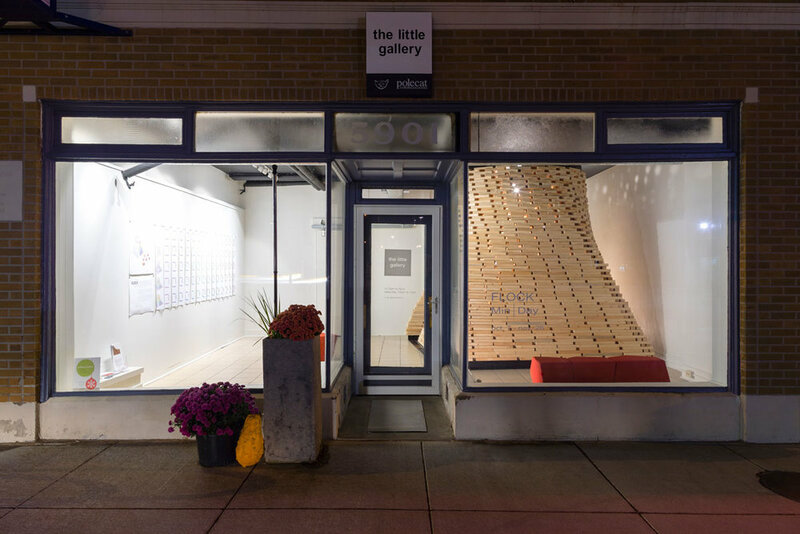 Join us for the opening party this Friday night to welcome our friends at Little Gallery into their new space. The exhibit will run from October 7 - November 26. Dwell has just published an article on Min | Day's Bucktown House in Chicago, an interior renovation of a spec house that includes MOD's 3-4-5 Table. If you don't subscribe to Dwell Magazine, you can check out the online version here: "Four Floors of Gadgets and Gardens in Chicago" by Winifred Bird and Dwell. AVA included in SFC&G curated list of "Architectural Furniture"
The print and online publication, San Francisco Cottages and Gardens recently included AVA in their product guide for Architectural Furniture. Check out the full list here. If you're in the Omaha area, don't miss your chance to go interact with MOD's Soft Stones. They are currently on display as part of Min | Day's inflatable installation, PNEUMAD, at Kaneko. The exhibition, Truck-A-Tecture, comes to a close on August 23 and has already received some excellent press coverage on Fast Company, Design Milk, Dwell and designboom, just to name a few. It was about one year ago that the first prototypes for AVA were unveiled at Fort Mason Center in San Francisco. As part of a new initiative by the American Craft Council, eight designers were asked to take inspiration from an exhibiting artist and showcase the work in a room-like setting. Min | Day was one of these designers and chose to work with ceramic pieces by exhibiting artist, Kris Marubayashi. How might a collection be displayed in a way that is active and ever-changing? How might a room change in response to a growing collection? How might a collection be viewed in order to highlight new and unexpected ways of seeing a collection? The result of Min | Day's exploration is AVA, a stackable display system to highlight collections, books and other precious possessions. The geometry allows for multiple stacking options from the simple and repetitive to the highly dynamic and unexpected. If you're in San Francisco this weekend, check out this year's show, which will include spaces designed and inspired by John K. Anderson Design (w/ pieces by Eliot Stith and Kris Marubayashi), Tyler Dawson Design (w/ pieces from Victor DiNovi), Hwang DeWitt Architects (w/ pieces by Lilith Rockett), Jiun Ho Interiors (w/ pieces by Kathy Colt and Emily Dvorin), Alison Damonte Design (w/ pieces by Ealish Wilson and Lilith Rockett) and April Powers Interior Design (w/ pieces by Shelley Martin). All colors are from the Maharam Scuba line, a high-quality, resilient, stain-resistant upholstery fabric. We love the look and feel of these fabrics and we think you will too! Feel free to contact us for fabric samples in any of the above colors. In addition, while the above five colors come standard, we are happy to make Soft Stones for you in any of the Scuba color offerings for a small additional fee. You can view the full range of options and read about the fabric on Maharam's website. As part of Min | Day's installation in Kaneko's Truck-A-Tecture show, Soft Stones is used to convey the flexibility inherent in mobile architecture. 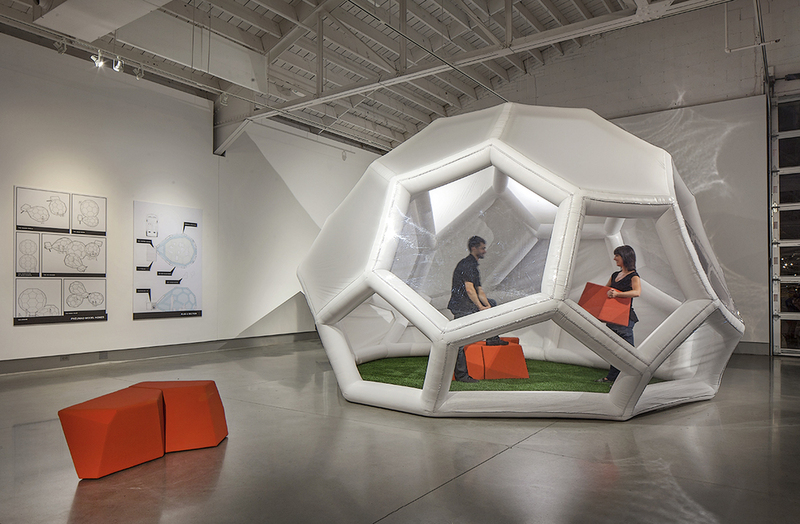 Truck-A-Tecture is on exhibit at Kaneko in Omaha, Nebraska from June 27-August 23, 2014 and features new proposals from notable architecture firms which examine architecture as redefined by mobility and technical expansion. Min | Day's installation, PNEUMAD is a combination of PNEUmatic (air-inflatable) architecture with a noMADic ethos. The PNEUMAD enacts a form of anti-heroic desire to escape permanence, solidity and place-bound dwelling. Recalling the revolutionary-experimental fervor of 1968, but with 21st-century technical sophistication, PNEUMAD is prototype for nomads who want to spread out. The inflatable offers one distinct advantage - it is not limited by the dimensions and volume of the vehicle itself. A very compact trailer can let loose and relax. Complementing the mobile structure, PNEUMAD has no interior plan, no fixed infrastructure - everything moves. MOD’s Soft Stones allow the nomad to resist fixity inside as well as out. We were excited to see MOD's AVA make an appearance, along with some of our favorite designers, in the Wall Street Journal's coverage of ICFF! See #5 below and check out Dale Hrabi's article on the current fascination with facets in furniture and product design here. No one could resist pulling Soft Stones apart to give it a test-sit. Creativity with a purpose seemed to be the trend at this year’s International Contemporary Furniture Fair. A trend that made the fair the perfect venue to launch MOD. We debuted our new line of modular furniture to a swarm of designers, editors, retailers and manufacturers who got to interact with the pieces and meet our team. 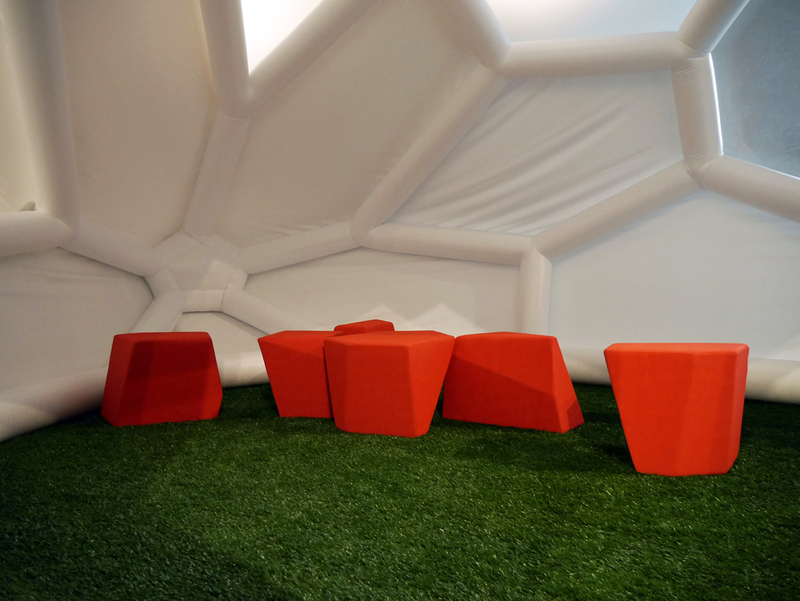 The Soft Stones seating set was a standout. MOD’s premiere product is available in July. A waiting list has already started for the much anticipated AVA sculptural storage system and the PenTables collaborative table. We are excited to announce pre-order availability and pricing details of these newest products at an event later this summer. Follow MOD on Facebook and Twitter. Just ahead of the show's opening, Newsday, a Long Island magazine, put out its shortlist of things to look for at ICFF. Check out Soft Stones on page E11 and stop by our booth to give it a try this weekend in New York! Visit us at ICFF 2014! Check out our booth (#1686) at this year's ICFF where we will be showing PenTable, AVA and Soft Stones. You can also get a sneak peek of some of our upcoming furniture pieces at the show.